I can feel the holiday season ahead…it’s time to start baking up a storm. But before the season kicks in…I thought I would share our Halloween Pumpkin! 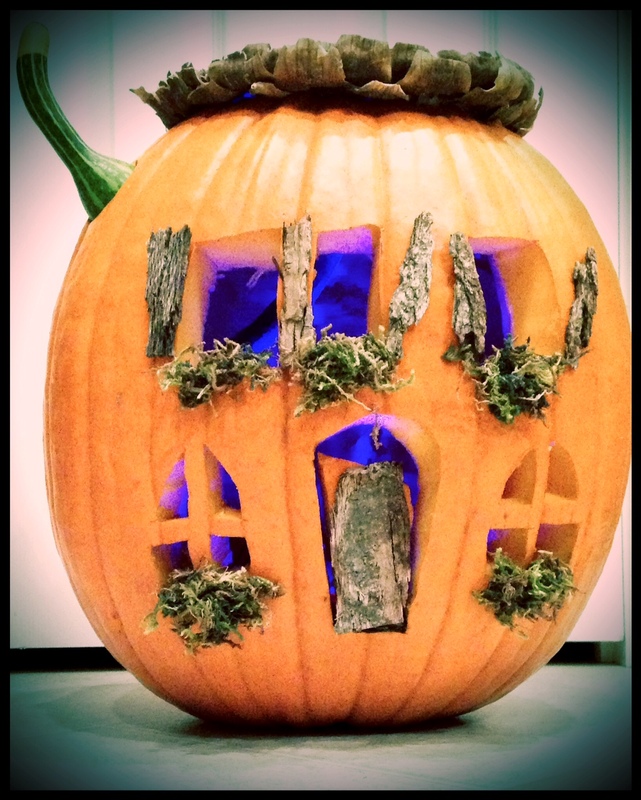 Here’s our Haunted Fairy House Pumpkin! Hope everyone has a Happy & Safe Halloween! 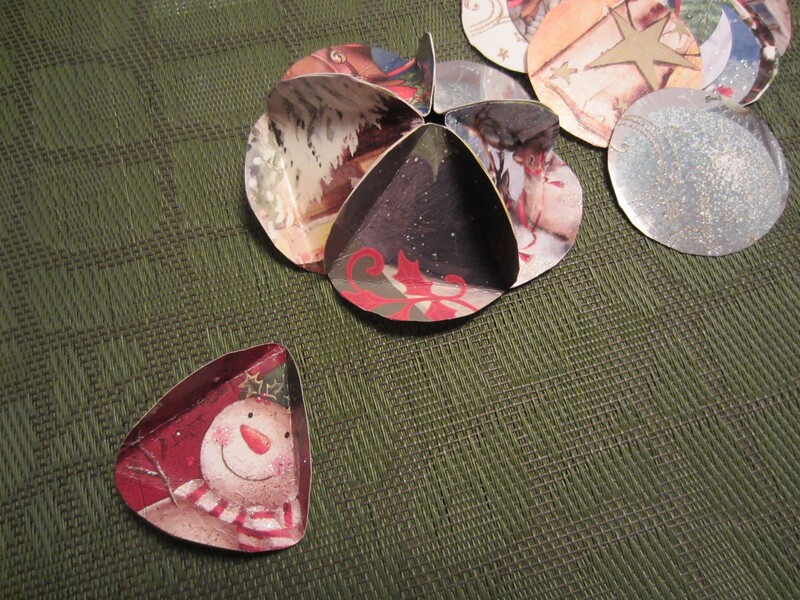 When I was a little girl, my Mom had a couple of these ornaments made out of Christmas cards that her grandfather made. They were pretty old and the paper was more delicate and even yellowing. 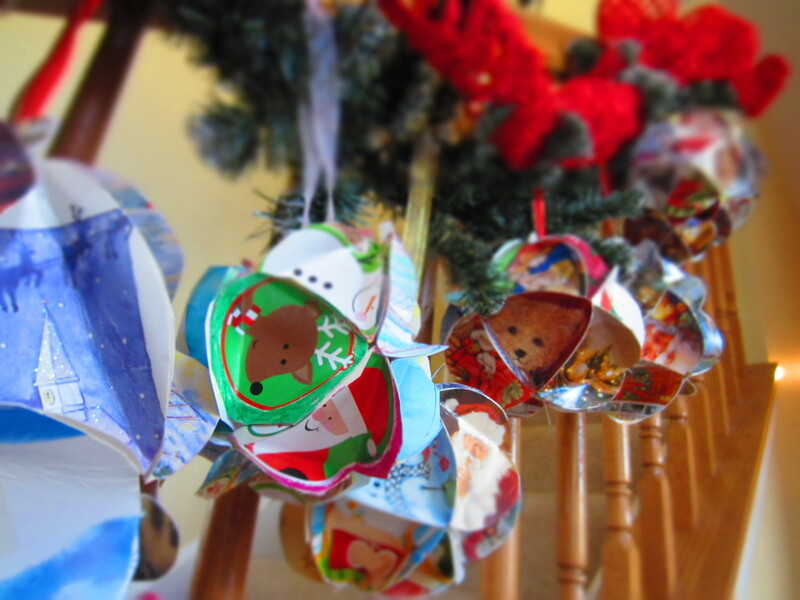 She would hang them from the top of the doorways leading to each room of the house at Christmastime. I remember standing under each one analyzing the pictures. About 10 years ago, I decided to figure out the secret to making them and they are actually very easy. I make it a tradition to make one every year from the Christmas cards that I receive. 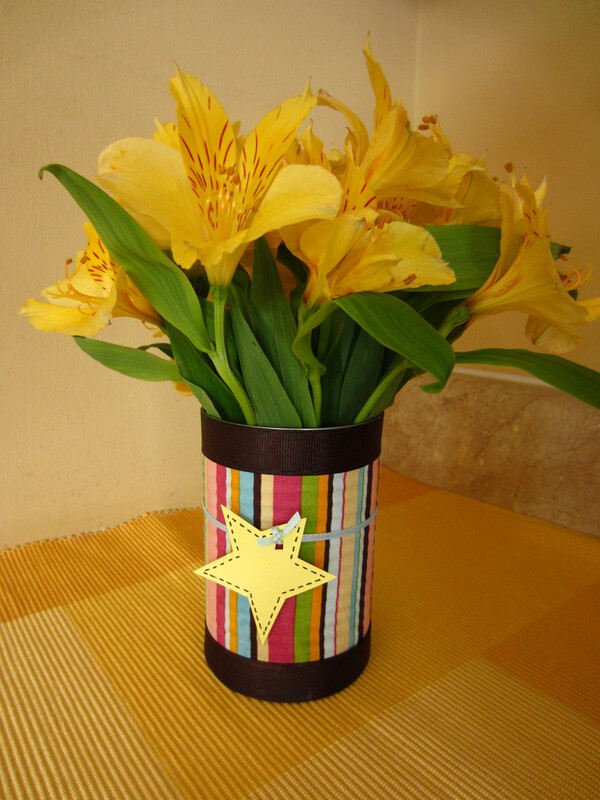 The picture are just beautiful and why not have a special way to repurpose them instead of throwing them out. I have signed and dated each one. On three, I even wrote if there was a special occasion like my baby’s 1st Christmas. They don my banister and hang from my evergreen roping. Each one is truly special and every year I enjoy pulling them out to hang. 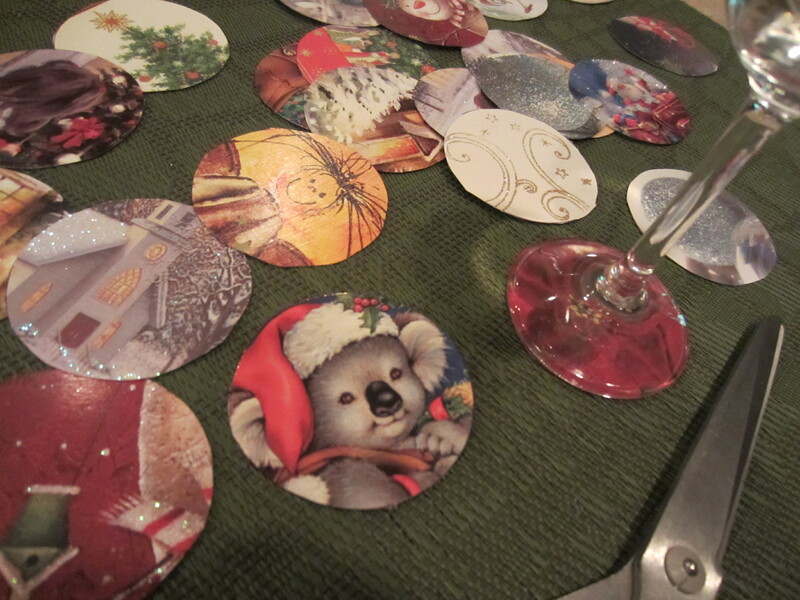 Instructions: I trace a circle around the main scene on each of my Christmas cards. If I can fit another circle around another image or pattern. The size of the circles drastically changes the size of the ornaments. Now, I use the bottom of a champagne flute to trace my circles. It is perfect because they are clear and you can see the image that you want to capture. You will need 20 circles to form one ornament. Fold each circle to form a perfect triangle. Glue the flaps of the triangle together. Five circles form the domed top of the ornament – each having the point of the triangle at the top of the image. For the bottom, glue 5 circles all with the triangle pointing to the bottom. This will close the ball of the ornament. Adhere a ribbon to the top to hang. Don’t forget to date them so you can treasure each one for years to come! This had to be one of my favorite parties! 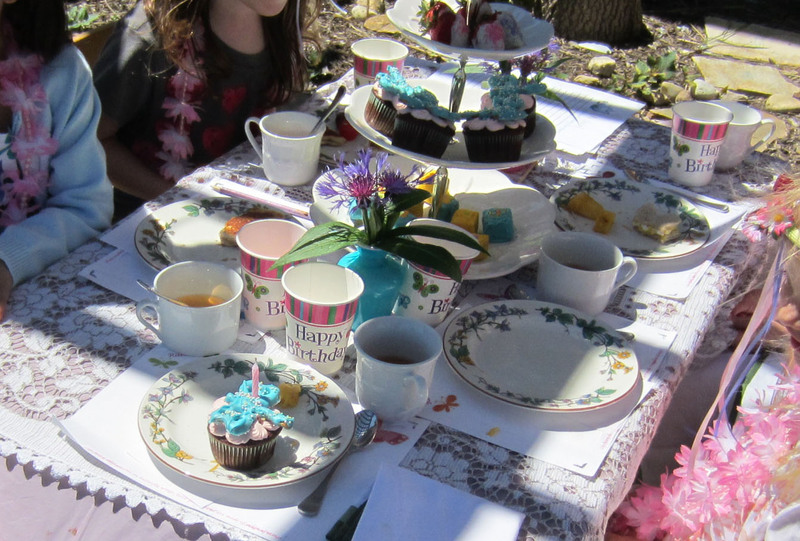 My daughter turned 6 and she invited a few girls for a quaint fairy tea party. The weather really worked out because we held it out in our yard under the pergola (though the backup plan was to have it indoors) and the garden was just starting to bloom. The fairies must have stopped by to open the flowers just in time for this magical afternoon. 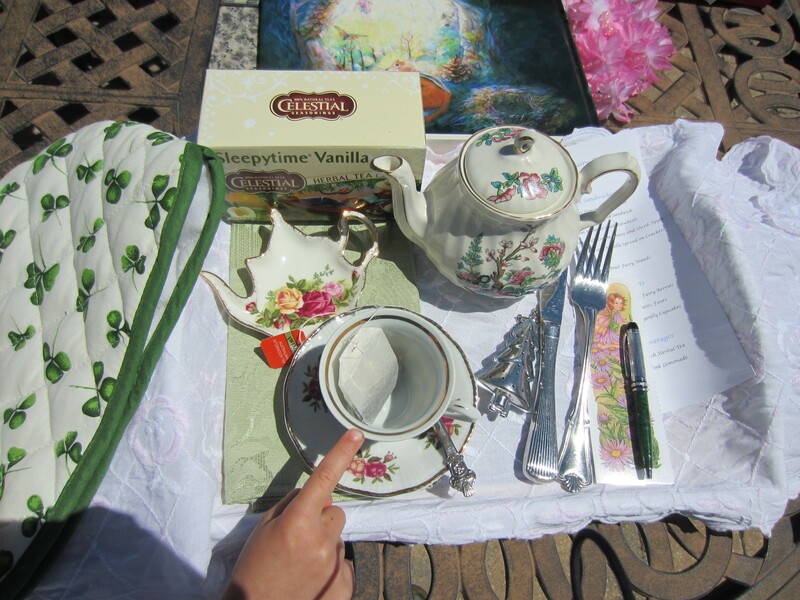 Don’t forget to make a place setting for the fairies! The preparations started the night before. My daughter was just ending her Kindergarten school year and has been very excited about writing. She left a note for the fairies by one of the many fairy houses in our backyard to “leave a sign that they were here to visit” and invited them to her party tomorrow. The fairies really did come to visit because when she checked the fairy house first thing in the morning, fairy dust was sprinkled at each fairy house in our yard with a few “gems” or polished glass stones. She sure anticipated her party after school! 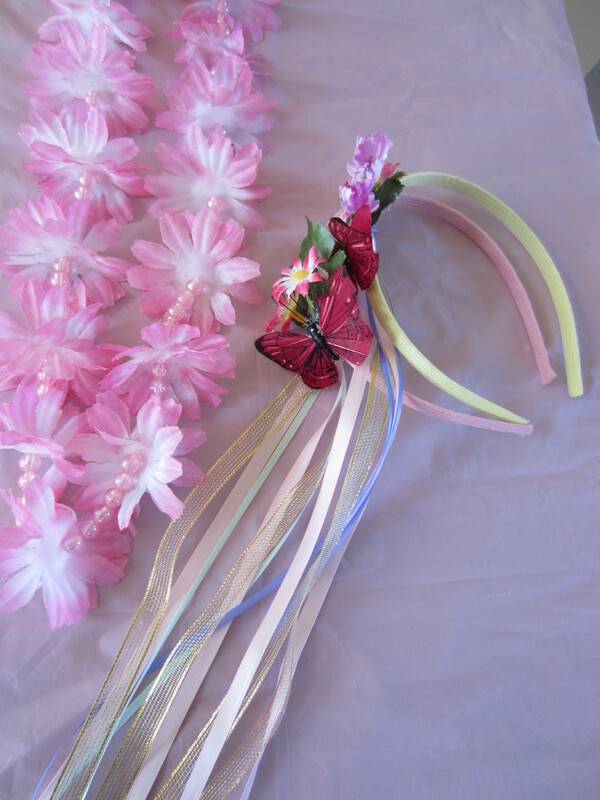 I made the headbands for each girl that attended the party using small silk flowers, ribbon and a butterfly and I found the package of headbands at the dollar store. 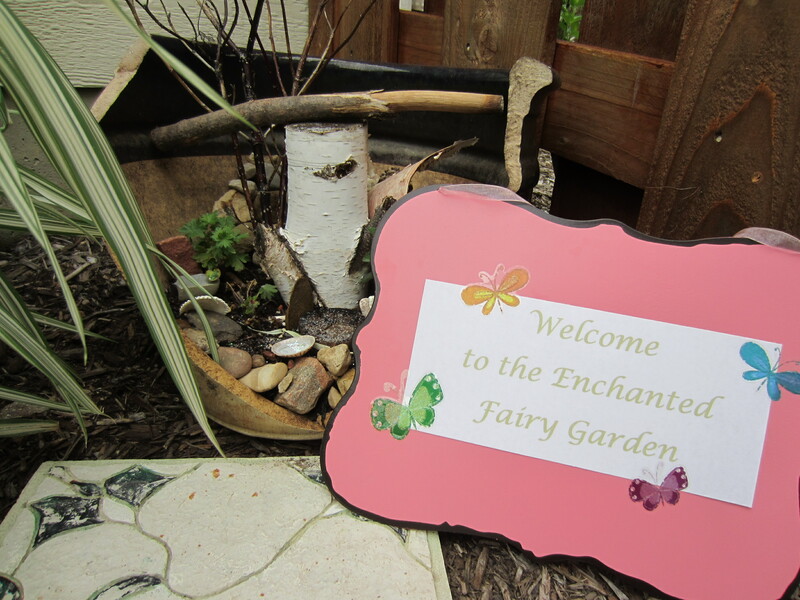 Her guests were welcomed into the yard by a “Welcome to the Enchanted Fairy Garden” sign and a fairy house. I made placemats for the girls out of white card stock with their name, butterfly stickers and a fairy quote “Like fairy dust gleams on butterfly wings, little girl dreams are made of magical things”. At the end of the party I put the placemat and menu in their goodie bag so they could bring them home. 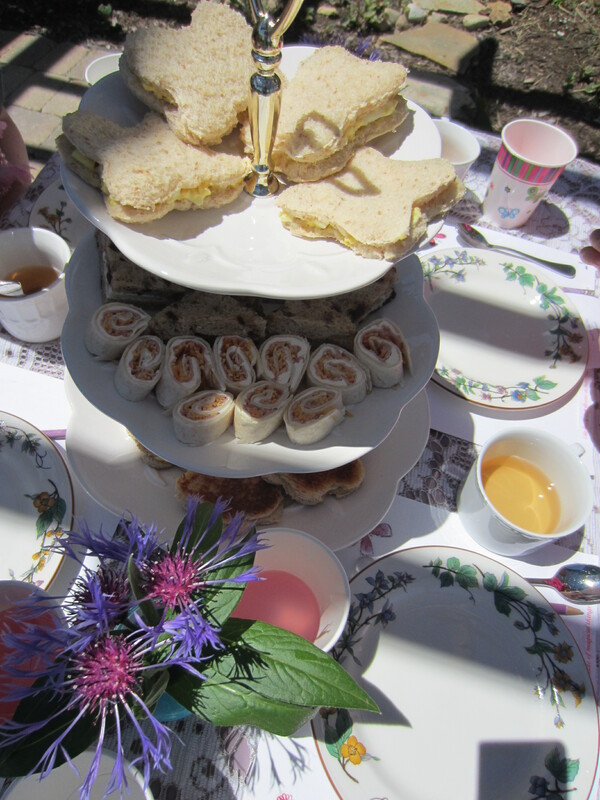 I served proper English style tea for the girls using a herbal peach tea. All of the girls were willing to at least try it. I think it is important to try new things and it was ok if they didn’t care for it, we then served pink lemonade. I thought this menu catered to most kid’s and I avoided peanut butter in case of food allergies. The biggest hit was the butterfly shaped grilled cheese sandwiches. I had the bread cut, buttered and the sandwiches prepared ahead of time. As I prepared the three tiered server, I put them on a hot griddle, flipped them and they were ready to serve. 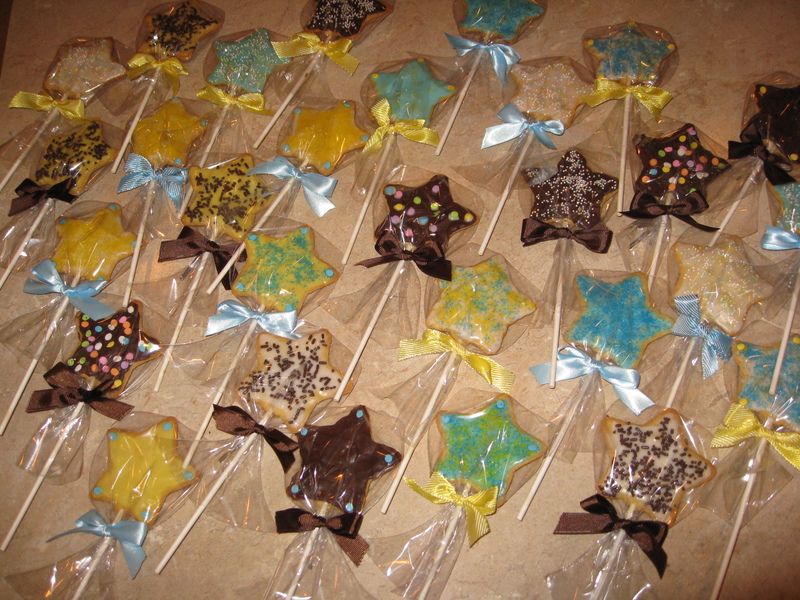 The fresh fruit fairy wands were made using wooden skewers. The dragonfly cupcakes really turned out beautiful. I dipped pretzels in melted blue chocolate wafers and pieced them together on wax paper. They perfectly stayed together to adorn the top of the cupcake. The devils food cupcakes were iced with pink cream cheese frosting. Desserts are served! 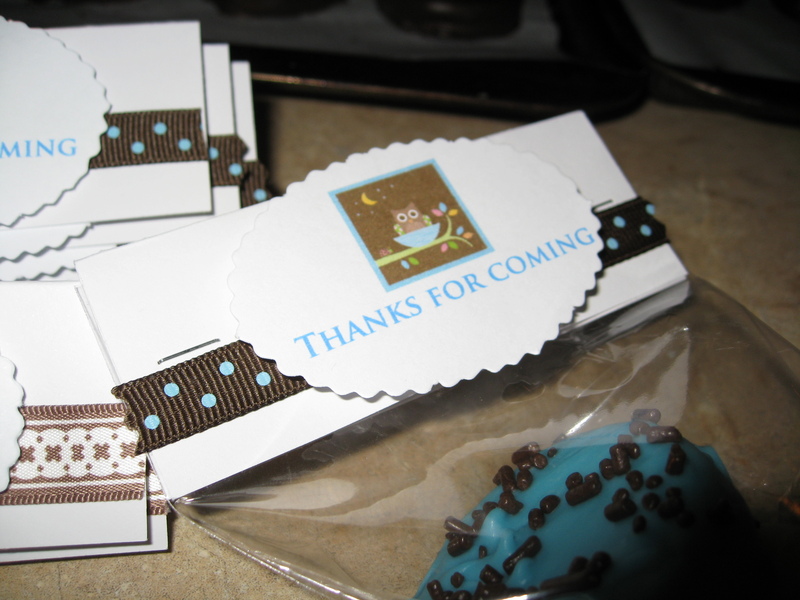 The petit fours were easily made using frozen pound cake cut into squares and dipped in different melting chocolates. These could be made a couple days in advance and kept in the fridge. We played two games at the fairy tea party. 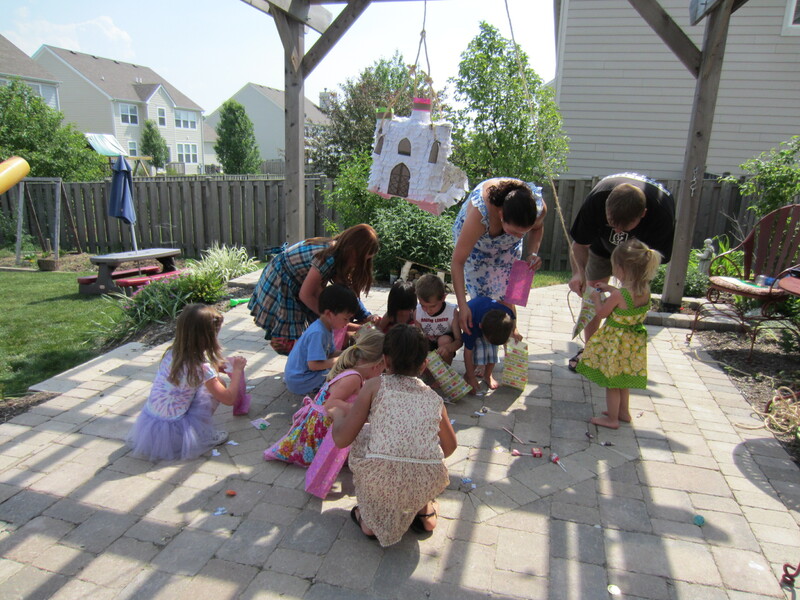 The first was an egg hunt in our yard and throughout the garden. 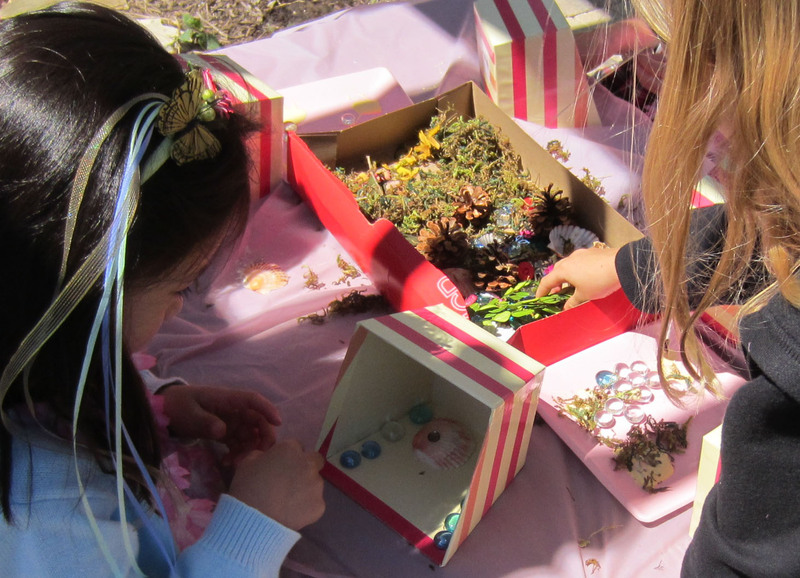 The plastic eggs were filled with small items that the girls will use to build fairy houses to take home. Some items included, glass stones, buttons, pinecones, sea shells, etc. The winner had found the most eggs. The second game was played in between courses. 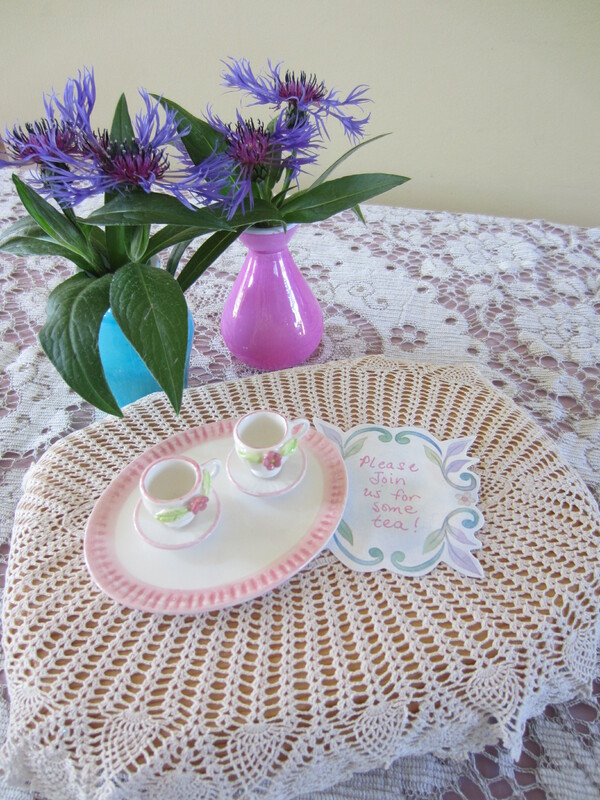 I filled a tray with “tea party” items and covered it with a table cloth. Once I removed the cover, I explained the items to the girls and they had one minute to look things over. I then covered the tray and gave them paper to list out as many items as they could remember. For young writers, they did a great job! After the girls finished up their dessert, I cleared the table to work on building a take-home fairy house. 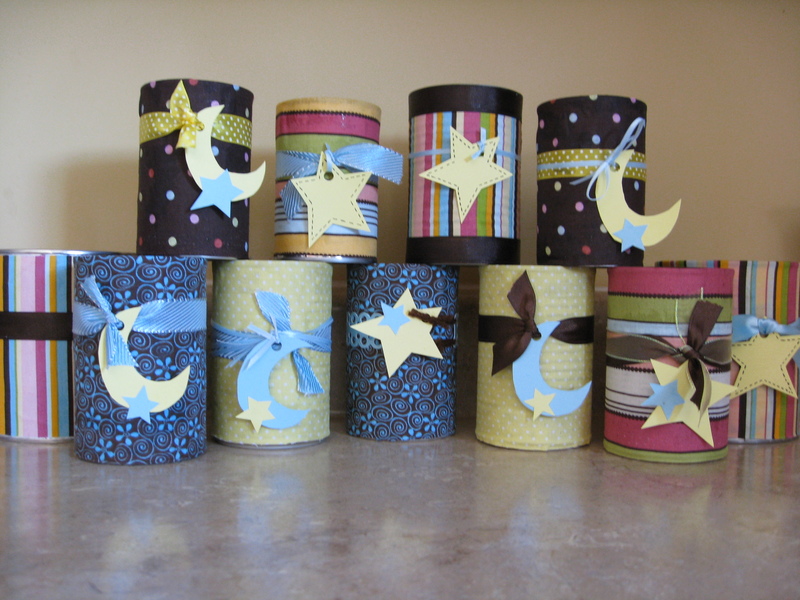 I found these little odd shaped boxes that I thought would be perfect to decorate. Prior to the party, my daughter and I filled a box with some natural items, clippings from the boxwood bushes, dried pressed flowers, sticks, pinecones and small stones. I purchased a small bag of moss, seashells and glass stones from the dollar store. Just a few paper plates with glue and the girls were ready to decorate their fairy houses. The houses are perfect to be kept in a dry place outside like a covered porch. 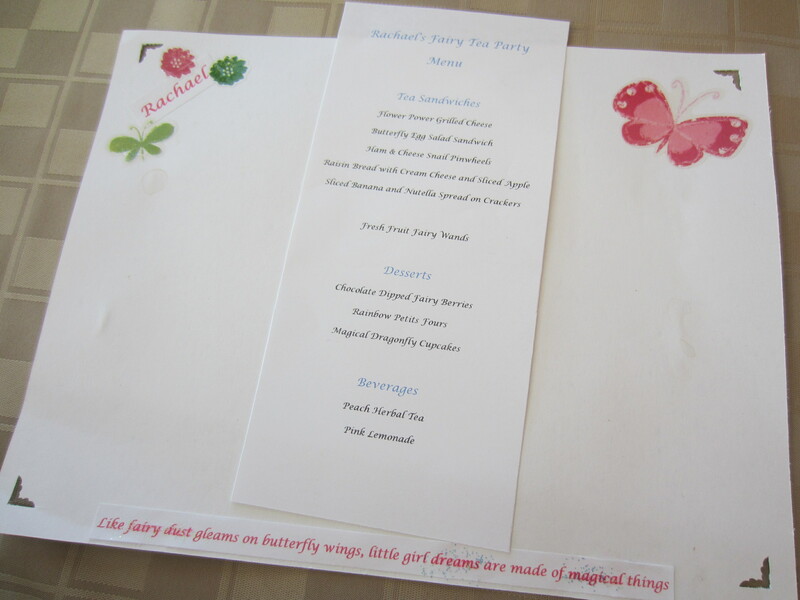 It appeared that the girls enjoyed their afternoon together and we were thankful for them coming to our fairy tea party. 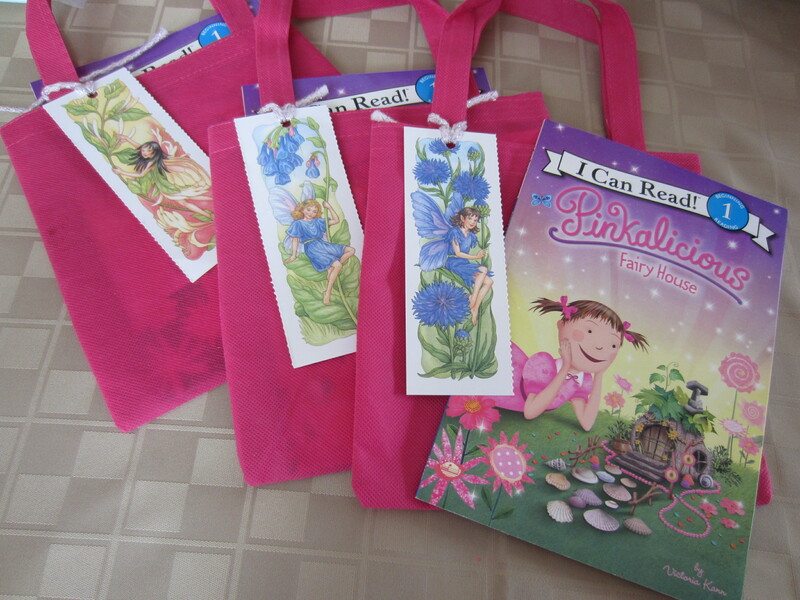 The goodie bags included a book on Fairy Houses and a fairy book mark – perfectly matching the Fairy Tea Party theme. My little ballerina turned 4 years old and we had a ballerina themed birthday party for her. This party theme was so pretty in pink, with a pink rosette ballerina birthday cake and matching cupcakes. I made these darling cupcake picks that looked like a leotard and tutu. 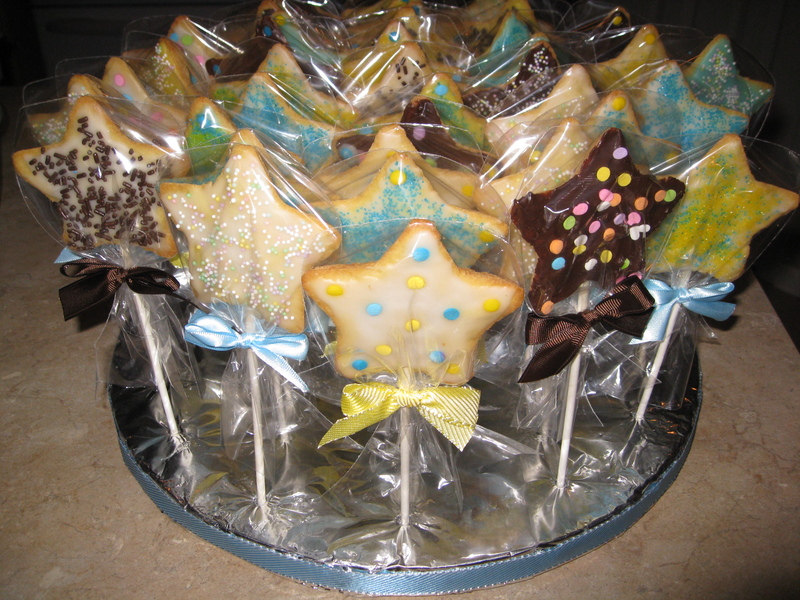 The leotard was made out of two pieces (front and back) of white cardstock taped to a cake pop stick. The tutu part of the dress was made from ruffle lace trim, glued to the card stock leotard and embellished with a satin ribbon bow. So simple and beautiful. Once they were complete, I realized that these would make a beautiful centerpiece for a princess party or bridal shower. 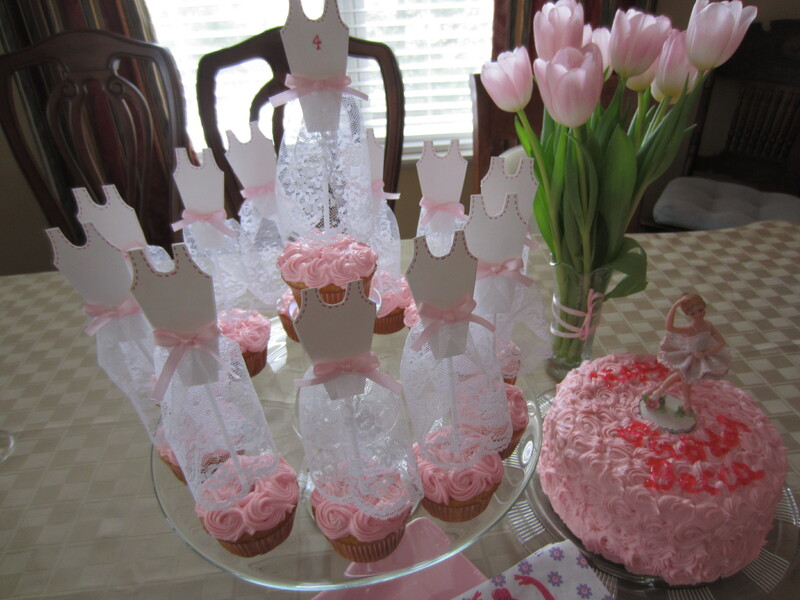 I displayed the cupcakes on a glass cake stand and elevated the birthday girl’s cupcake on an inverted champagne glass. The cupcake fit perfectly on the base of the stemware. The cupcakes were filled with a surprise in the middle. Cupcake can be filled with many different things, but since the cake was filled with a strawberry pastry or cake filling, I thought I would change-up the cupcakes. 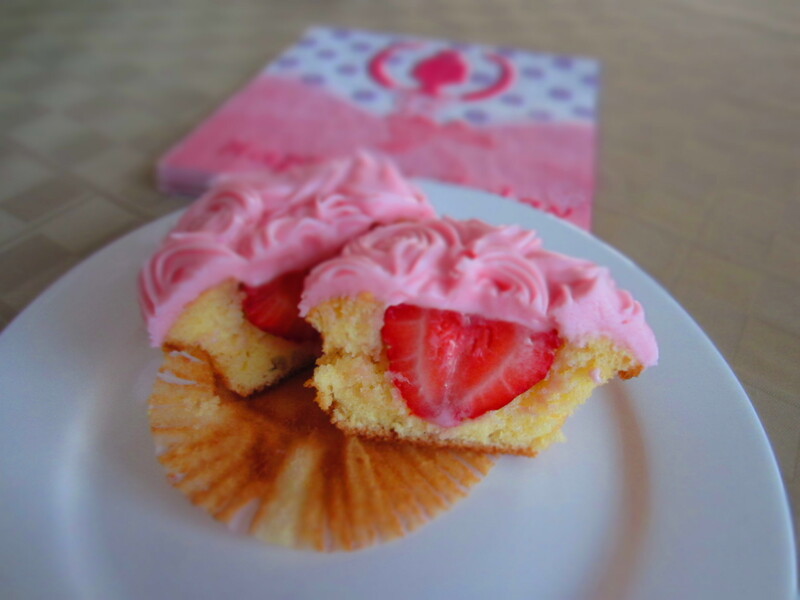 The cupcakes had a whole strawberry inserted into the cupcake. 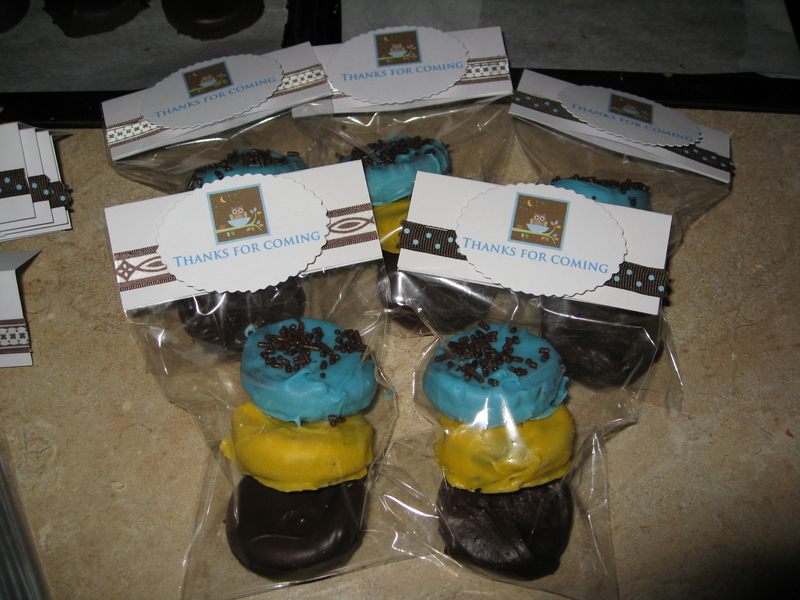 Oh and were they a big hit with both the kids and adults! 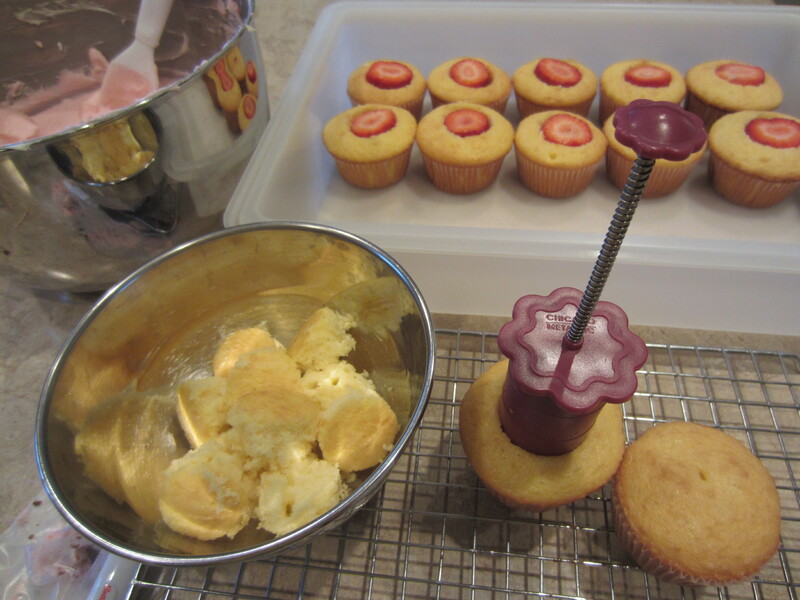 The happy baker was so excited to use a new tool in my kitchen – a cupcake corer. This made the whole process so easy to scoop out a perfect chunk of cupcake to insert a whole strawberry. The cupcakes were then frosted with pink cream cheese icing using a large star-shaped decorator tip in a swirl rosette pattern. Who wouldn’t want to sink their teeth into one of these? It is not often when I create a post that is not food related, but I thought this was just too cute to pass up and not share. 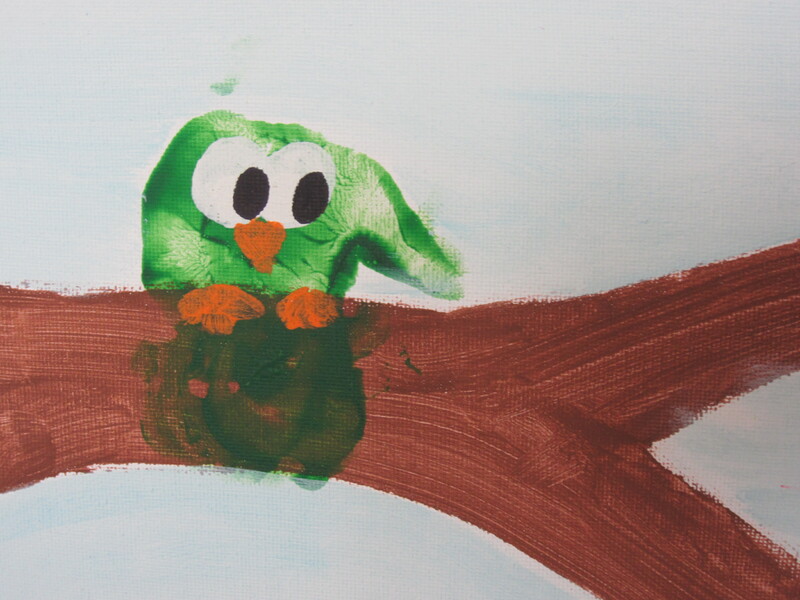 For my daughter’s 2nd birthday party, we did an owl painting activity with my kids and niece. Check out my prior posts for the owl cookies and owl cake that were made to celebrate this birthday and read on to see how we made the owl painting that will be a keepsake to remember for the birthday girl. I bought a couple of inexpensive 16″x20″ canvases from our local craft store. Using Crayola washable finger paints the kids painted their handprint onto the brown branch that I had painted before the party. 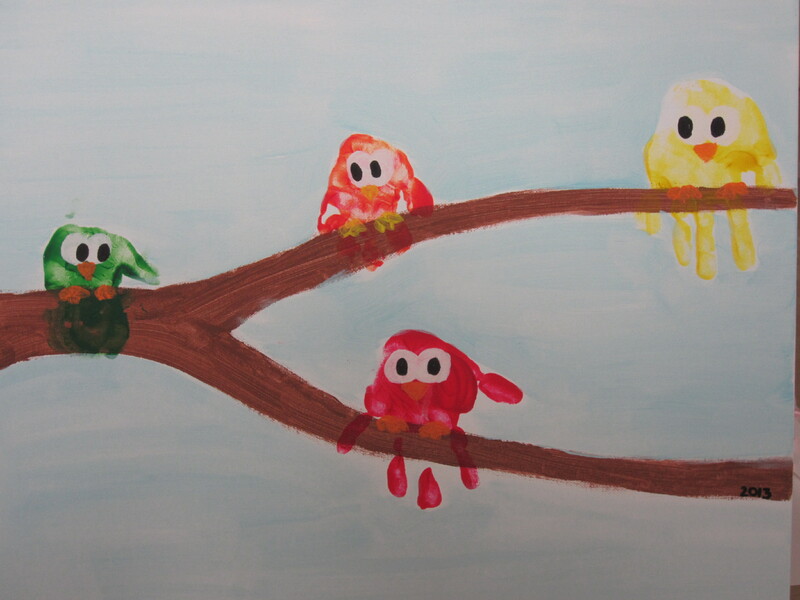 Each kid got to pick a color for their owl. After the party, I enhanced the painting with the eyes, beak, talons and brushed the background light blue. This painting will be hanging in our playroom and our niece is going to get one as a party favor. Imagine how much fun this is for a kid’s birthday party? Kids love to get involved in the kitchen and definitely like to help decorate for Christmas. I was planning on making a real gingerbread house, but ran out of time. This project turned out to be real hit with my kids: ages 5, 3 & 1. Each kid had made their own house. The two older kids could do most of the work with little assistance from me and we tried two different construction techniques. For my 1-year-old, I made the structure and she helped decorate the house and ate a few M&Ms along the way. The best part is that I had all of the ingredients in my pantry. Think about what you have and get creative! Cut the graham crackers to the size and shape house that you want to construct. My 5-year-old was patient enough to be able pipe icing along the edges of the graham crackers to hold the walls to the floor and then the roof to the walls. To construct my 3 year old’s house, we used a small milk carton and cut the top off. This way she could easily spread some icing on the carton to make the graham cracker walls to stick. To fill in the gaps at the corners, we applied mini pretzel sticks. The kids had a lot of fun decorating the houses with cereal, candy and pretzels. Even my 1-year-old enjoyed squeezing a bag of icing and placing mini M&Ms on the roof. She got a kick out of Santa and Mrs. Clause standing at the door. I flipped through the holiday ads that came in my Sunday newspaper to find the perfect size Santa, Snowman and Gingerbread Man. I glued the image to a piece of the cardboard milk carton and the kids were easily able to use icing to adhere the image to the doorway of their houses. The houses were the perfect size to sit on my kitchen window sill. A perfect place to display them and decorate our kitchen! We even constructed a chimney and placed some pieces of marshmallow for smoke. I helped by piping some icing along the roof of the house to make icicles. Hope you had a great holiday and enjoyed with your kids! Hear ye, hear ye, my eldest daughter is turning 5! We hosted her first kid’s party with a princess castle birthday theme. My creative juices were flowing! We invited about ten boys and girls and their parents. 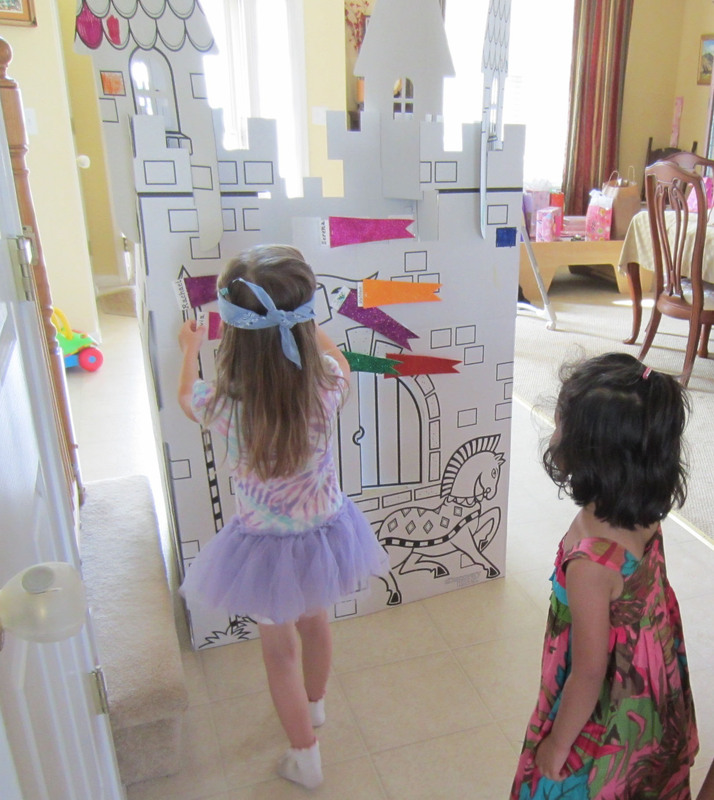 Since this party was co-ed, I concentrated on a “castle” theme over Disney princesses and frilly princess apparel. Here are some ideas to impress your guests and keep the kids busy and having fun! For dessert, I made homemade sugar cookies in addition to the birthday cake. 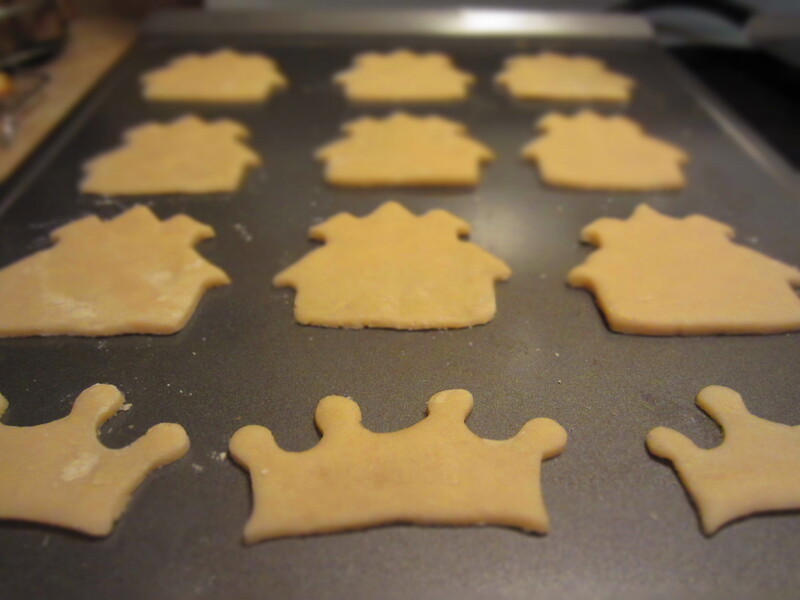 The castle and crown cookie cutters were from a 3 piece Princess Cookie Cutter Set by Wilton. My baking projects usually occur late at night to avoid distractions. The first night I worked on baking the sugar cookies. Once they cooled, I stored them in plastic storage containers to keep them fresh. The following night I made icing by mixing 1 C powdered sugar and 1-2 tsp of milk until the right consistency is reached. 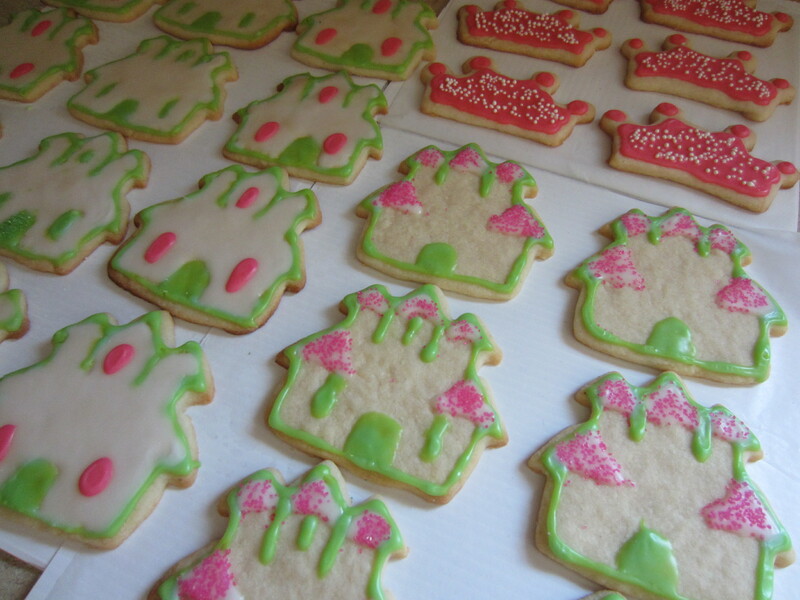 Since my color scheme was lime green and pink, the castle cookies were outlined with lime green icing (add one drop of green and one drop of yellow food coloring to the batch of icing until the desired shade is created). 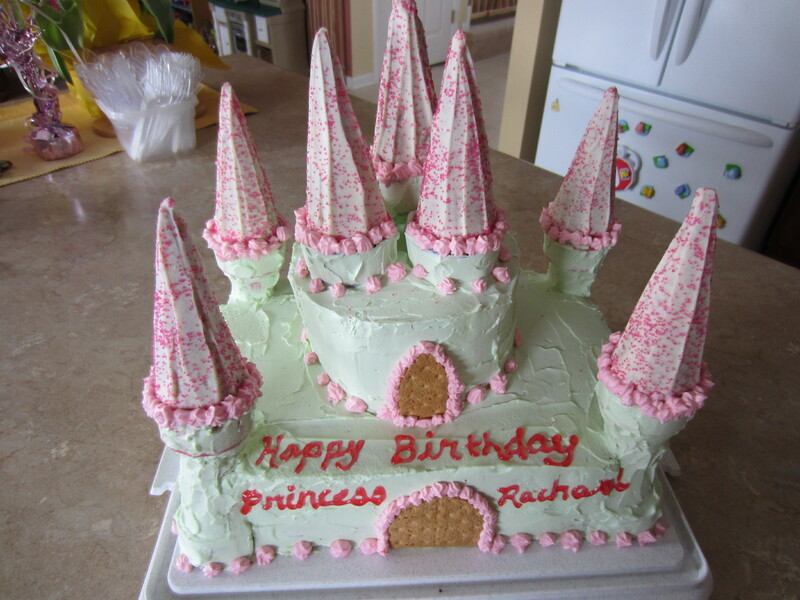 Carefully outline the castles, let the outline set, and then flow white icing in the middle. I made a small batch of princess crowns using a brighter shade of pink icing and white sprinkles. 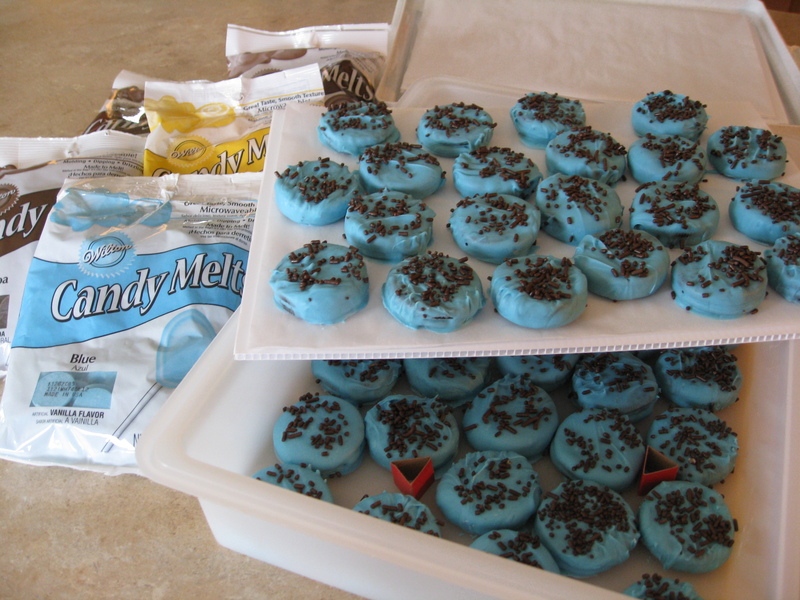 Once the icing is set, store the cookies in a plastic storage container to keep them fresh until the day of the party. The cookies were made one week before the party. Decorating the cake usually has to be done the day before the party, but I like to do things ahead of time if possible. The spires for the towers of the castle were plain sugar cones that were dipped in mint favored white Melting Wafer chocolate. Once they were dipped in chocolate, I smoothed with a knife and bright pink sprinkles were added. I stored these for a few days in a cool place. The cake was made from four box mixes because I wanted to alternate the layers of devil’s food and yellow cake. 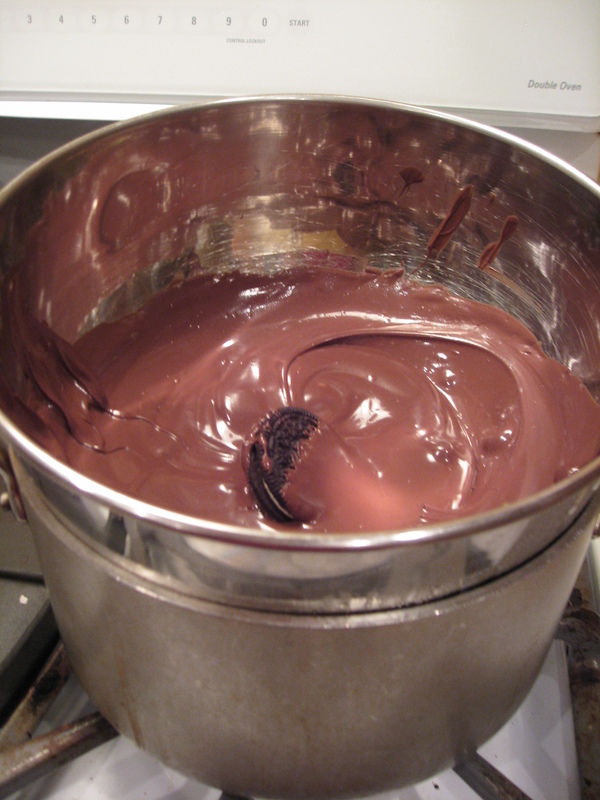 I used a 9×13″ pan for the bottom layers and a 6″ round pan for the top layers. I had extra batter when making the 6″ rounds, so I filled 11 wafer cones half way with batter and baked them in muffin tins. 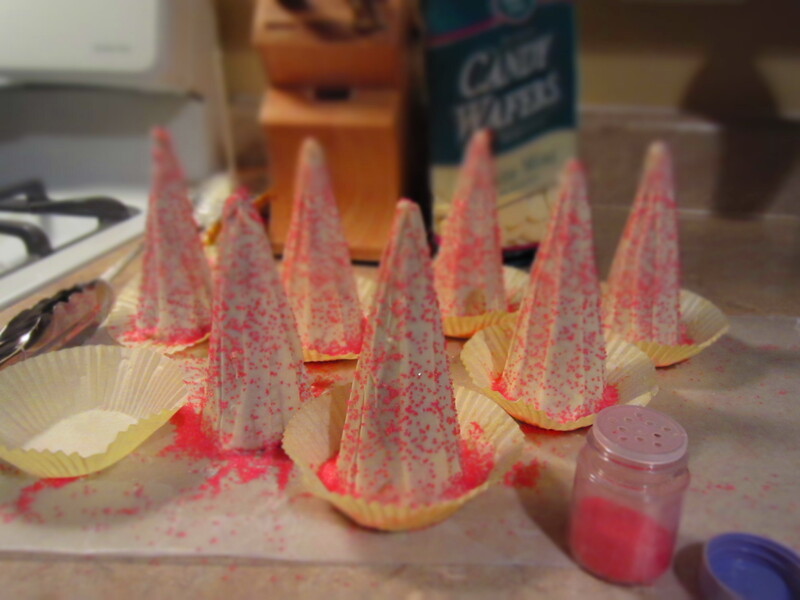 The cones baked well but softened a bit after being stored, so I refrigerated them before building the cake. To build the towers, I used one wafer cone upside down and placed one wafer cone right side up, then added a dowel rod to stabilize. 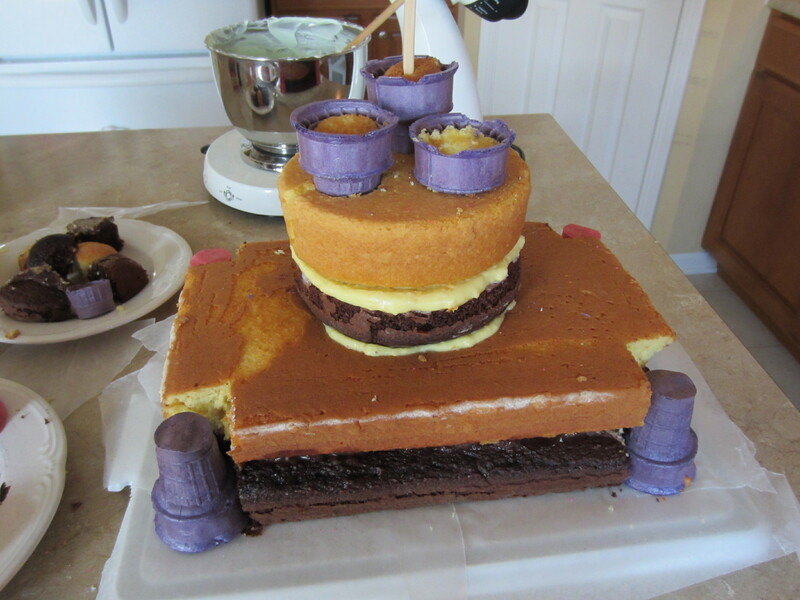 I also stabilized the center of the cake with a dowel rod to prevent the layers from slipping. The layers were filled with vanilla and chocolate pudding. 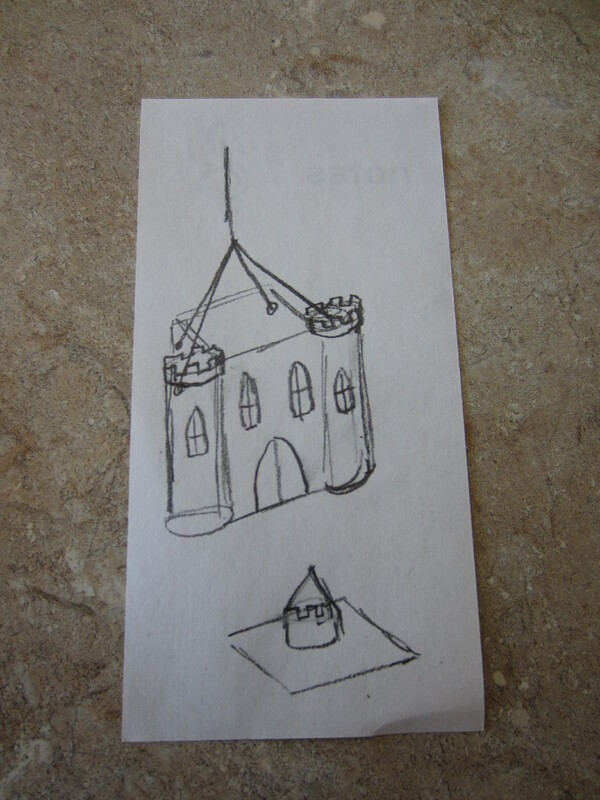 Once the cake was iced, I cut graham crackers in a gothic shape for the drawbridge and windows, then carefully placed the spires on the towers. 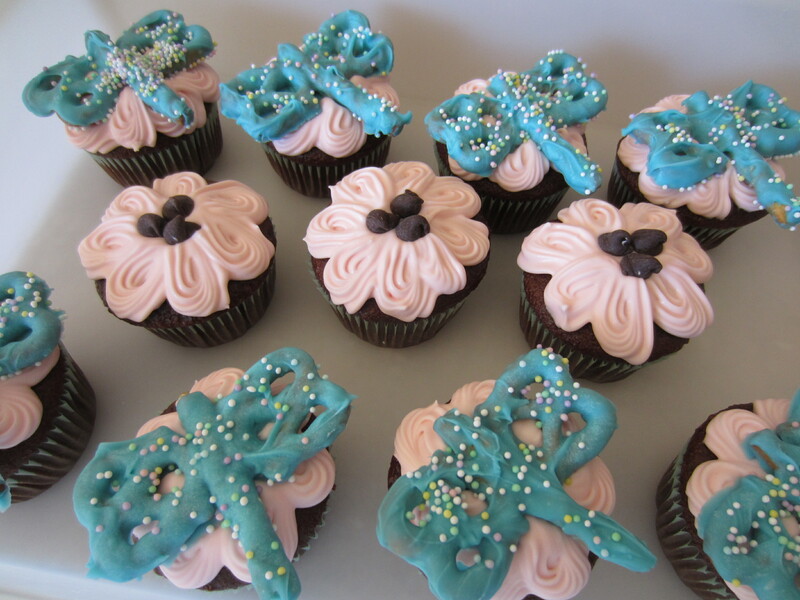 I trimmed each with pink icing florets. The kids were kept busy and together from the time they arrived. The stand-up cardboard castle was a huge hit. As the guests arrived they were directed to a craft table full of cardstock di-cuts, crown foam shapes, adhesive jems, stickers, glue sticks, washable markers and watercolor paints. Each kid was able to decorate the castle with their own creativity. This kept all of the kids busy for well over an hour until lunch was served. Pin the banner flag on the castle (like pin the tail on the donkey). I had pre-cut flag shapes out of glitter foam sheets and kids were allowed to select their color and attach their name to their flag. The stand-up castle had a picture of a flag that we used as the target. Then had a “dragon” egg hunt in the yard. I had 40 plastic Easter eggs filled and hidden in our yard. All of the kids had a blast and my daughter had a very memorable 5th Birthday Party! Our house is gearing up for a kid’s birthday party! This is actually our first kids birthday party. We will be celebrating my oldest daughter’s 5th birthday. She is still very into “princess” stuff, like most other girls her age. But this will be a co-ed party, so I have tried to emphasize a “castle” theme – there won’t be a lot of pink, frilly, princess decor that the boys will be turned off by. She really wants to have a piñata at her party. I looked around and there are some real cute castle piñatas that you can buy pre-made at the stores. Most of them are pink and some even have the Disney princesses on them. Can you imagine the boys busting these girly piñatas apart (maybe that wouldn’t be such a bad idea!)? So instead, I decided to make and decorate our own. Funny thing is that I haven’t done paper-mache since I was in kindergarten….so why not get my kids involved for a craft project?! Here is what we made and how did it! I remember making a piñata in school by placing strips of newspaper in glue and placing them over a large balloon. Once the paper set to dry the balloon could be popped and the paper would hold its shape. 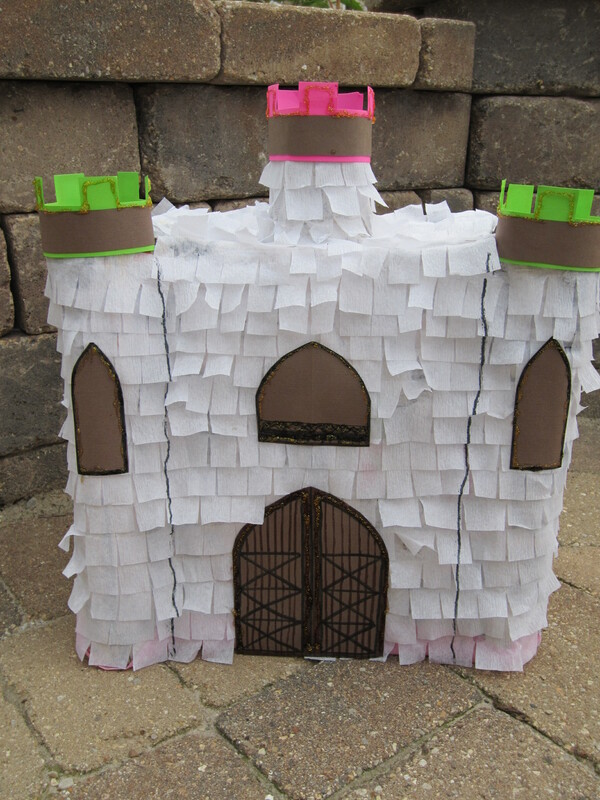 How was I actually going to accomplish making a piñata in the shape of a castle? It took a little fuss, but I enjoy taking on crazy projects like this and my kids are perplexed watching me accomplish the hard parts and they love getting involved with the easier or messy tasks. I was pondering about building a structure using recycled boxes and cardboard. Once it was taped in place I could paper-mache over it – mmm….more pondering! 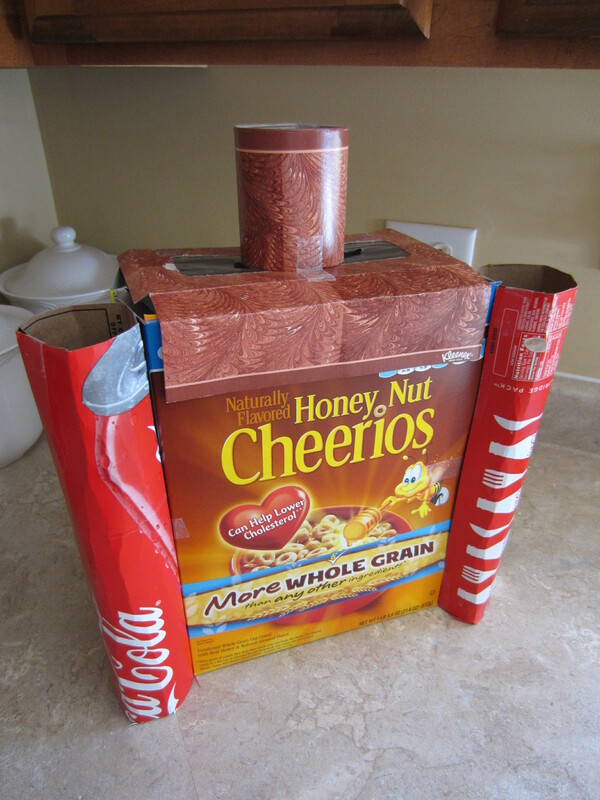 To create the structure, tape two similar sized cereal boxes together. The cylinder shaped turrets were created by rolling two pieces of thin cardboard from a fridge case of Coke. Tape the cylinder shapes to the front corners of the cereal box. Account for leaving an opening in the top of the piñata to fill it with goodies. The top of a tissue box works out perfect. To finish it off, a small cylinder tower was taped on top of the tissue box opening. NOTE: Do not tape this piece on yet. See #10. Wrap the cereal boxes and turret structure with plastic wrap. 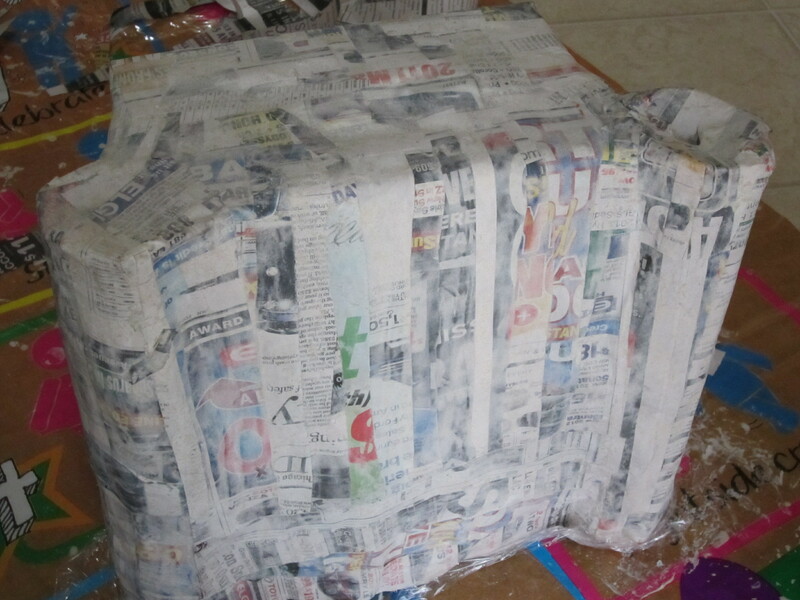 This allows the box structure to pull out easy once the paper mache has dried. Paper mache recipe: 1 part flour to 1 part water. I worked with 1 C of flour and 1 C water at a time, but needed to make 4 or 5 batches of paste to complete the project. Cut 1 inch strips of newspapers. 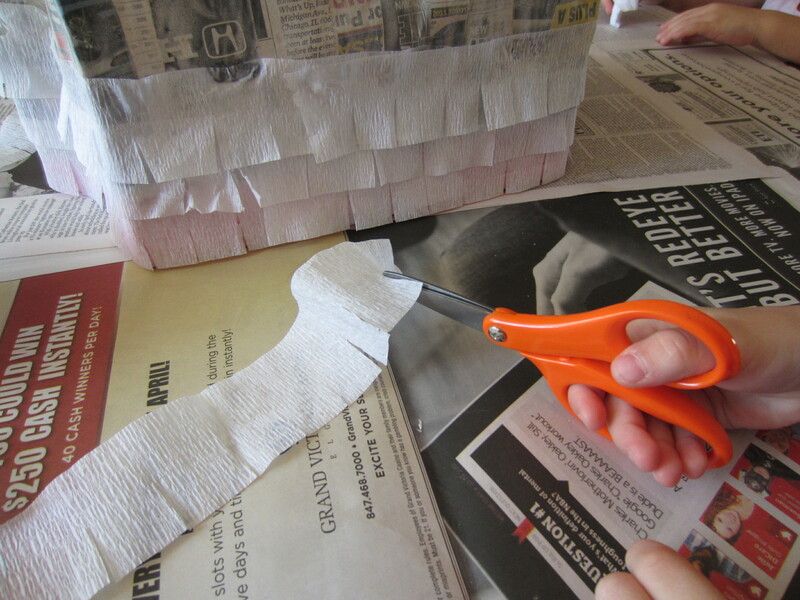 Soak each strip of paper in the paper mache paste until it is wet, remove the excess paste before pasting it to the structure or it will be too wet. Turn the box structure upside down and place strips of paper on. NOTE: 1 layer of paper made a very solid structure, I would not apply multiple layers because the kids will not be able to break it. I let this structure dry in place overnight. NOTE: The structure does not need to be perfect. Any imperfections will be covered up when decorating. The next day, carefully remove the boxes and plastic wrap. 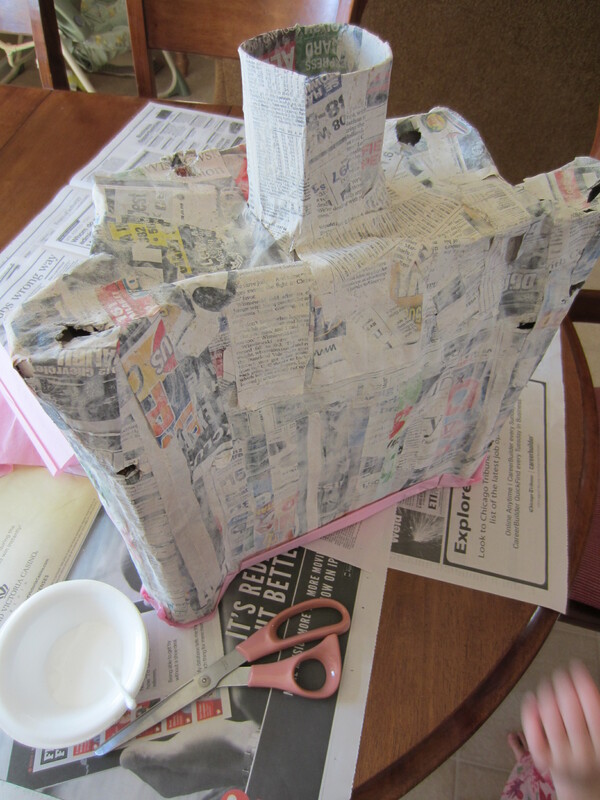 Tape the top tissue box structure to the dried paper mache. Make one batch of paper mache paste. 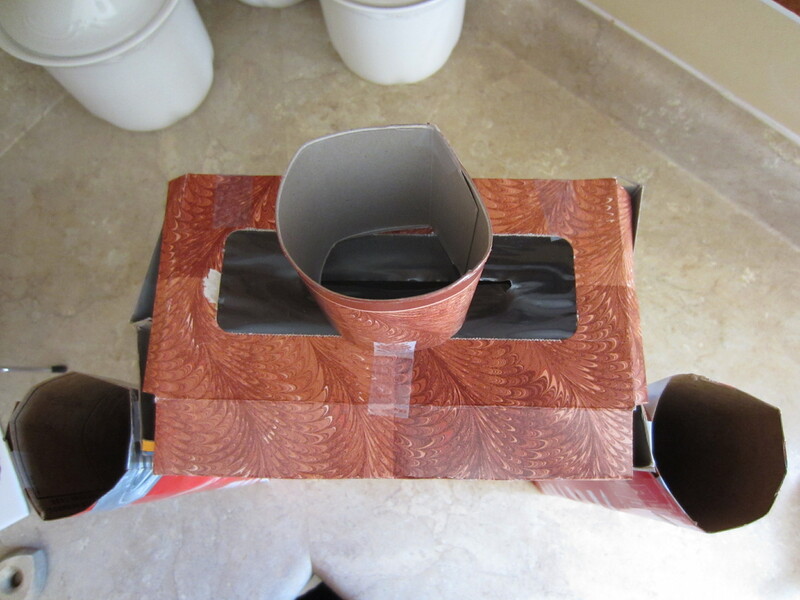 Place newspaper strips over the top of the tissue box, leave the cylinder shaped tower open (this is where the candy and goodies will be placed). These pieces of cardboard do not need to be removed. Glue a sheet of tissue paper to the bottom. Cut crepe paper streamers the length of the circumference of the castle. Each strip should be cut to make a fringe. My little baby is turning 1! I grew up never having a store-bought cake on my birthday. My Mom always baked and came up with a clever a “theme” for each of our birthday cakes. These cakes gave me some great memories growing up…some of my favorites were a doll cake, carousel and Raggedy Ann. Now that I have my own kids, I even appreciate these cakes more because I realize how much thought and effort my Mom put into each cake to make my day special. I find myself wanting to do the same for my girls. I noticed that my baby really enjoys The Very Hungry Caterpillar book and pretty much any book by Eric Carle probably because of the vivid artwork. So that gave me inspiration for her birthday theme. I started pulling ideas together a few weeks in advance and got to work with little projects that I could do ahead of time. This little guy was made out of green and red mini craft pom poms. I glued them together with a hot glue gun and wound floral wire around him to give it the shape. I then added a small piece of purple pipe cleaner for the antennae. I wrote my message on a leaf-shaped piece of card stock and using a round hold punch made some bites out of the leaf. I took a photo of the caterpillar and attached it to an email to invite our family (I really don’t need to mail a formal invite). Not only did I use him to send a message, but he will also “live” in a clear recycled jar which I will use as a table decoration for the party. 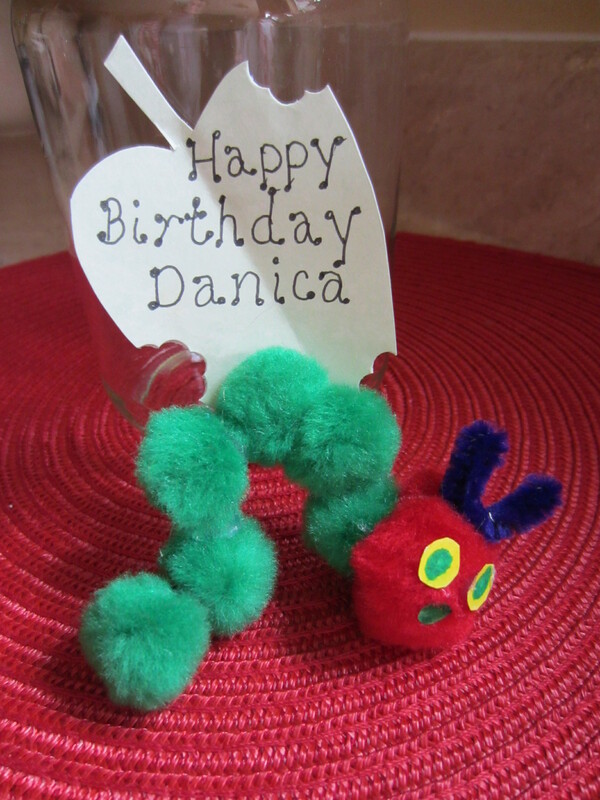 I am planning on making a caterpillar birthday cake and have been recently intrigued with cake pops. This was my first chance to try them out! 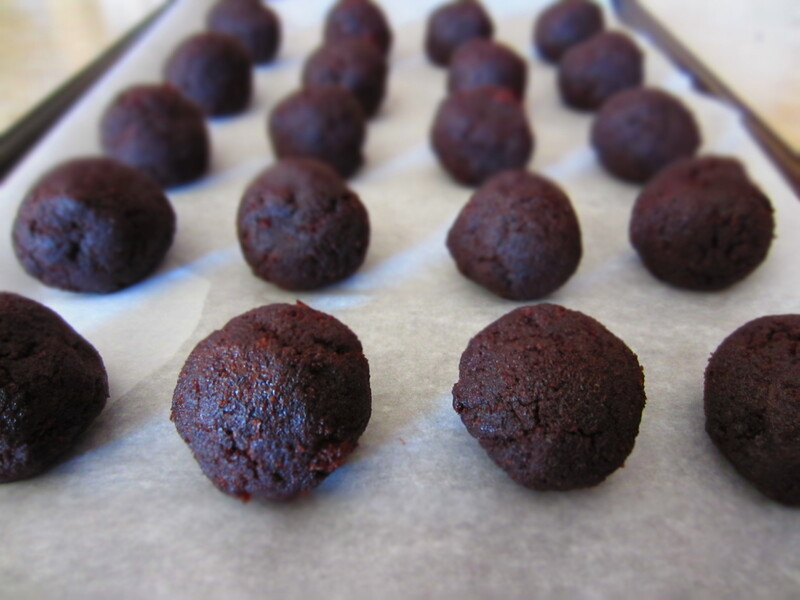 I made a devils food cake box mix and added chocolate icing to make the cake balls. So far, so good and I popped them into the freezer for about 15 minutes. I started to melt white candy melts and got my sprinkles ready. As you can see in the photo of the finished product, my inspiration for the decoration was from the bright dots in the book and I thought these sprinkles mimicked them perfectly. 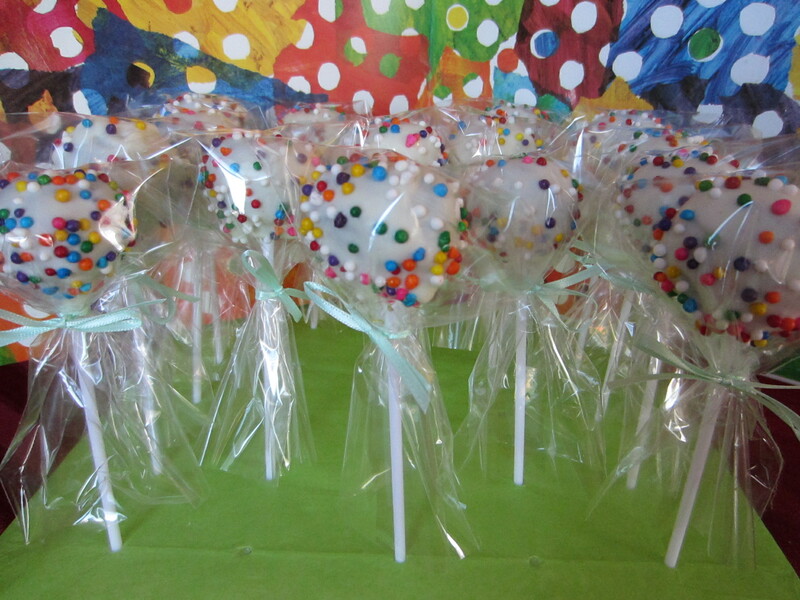 My first cake pop turned out perfect and then I started to struggle a little with the chocolate dripping, but I got it figured out and they didn’t turn out too bad for my first time. I bagged them and tied them with matching satin ribbon. 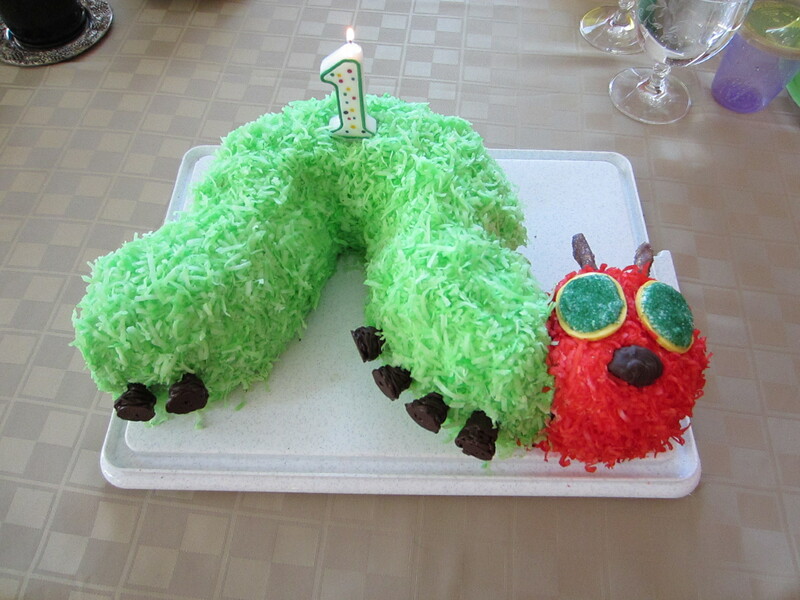 A few nights before the party, I worked on making the eyes, feet, antennae for the caterpillar cake. I melted milk chocolate candy melts in a squeeze bottle and kept spiraling the chocolate into a candy kiss shape. It was easier to build it little by little and let it harden, then layer more on top to get the perfect shape. Before it was completely cooled, I poked toothpicks in each one. The toothpicks will be poked into the side of the cake and be perfectly held in place. For the eyes, I melted a few yellow candy melts and used a teaspoon to scoop some onto wax paper and smeared it into an oval shape. I quickly sprinkled green sugar over the top. Once they cooled, I scooped another teaspoon full of yellow to create the outline or bottom layer into an oval shape and gently pressed the cooled green center into it. 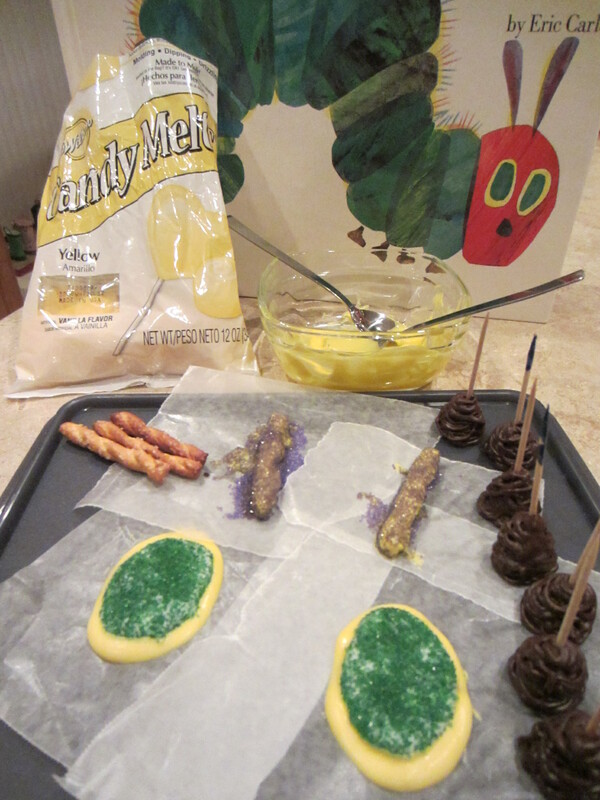 For the antennae, I dipped small pretzels into the candy melts and sprinkled them with purple sugar. 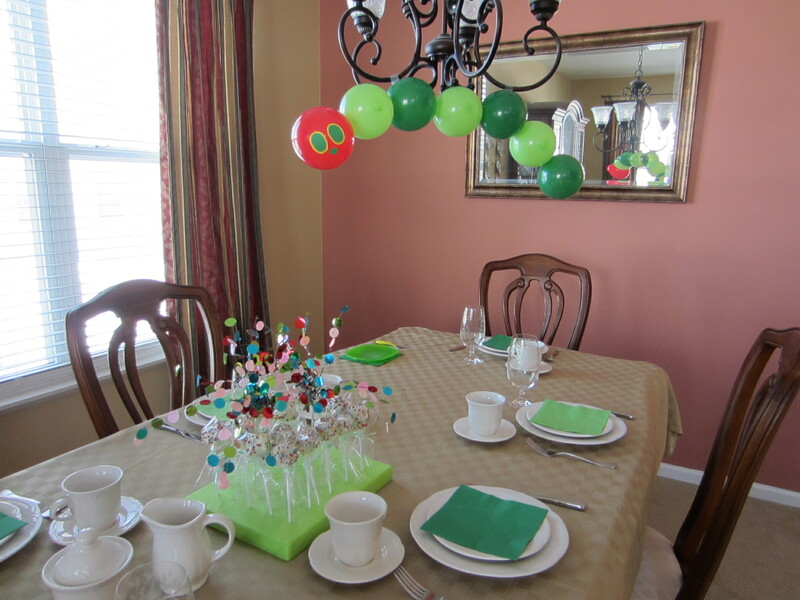 The cake pops were my table centerpiece. 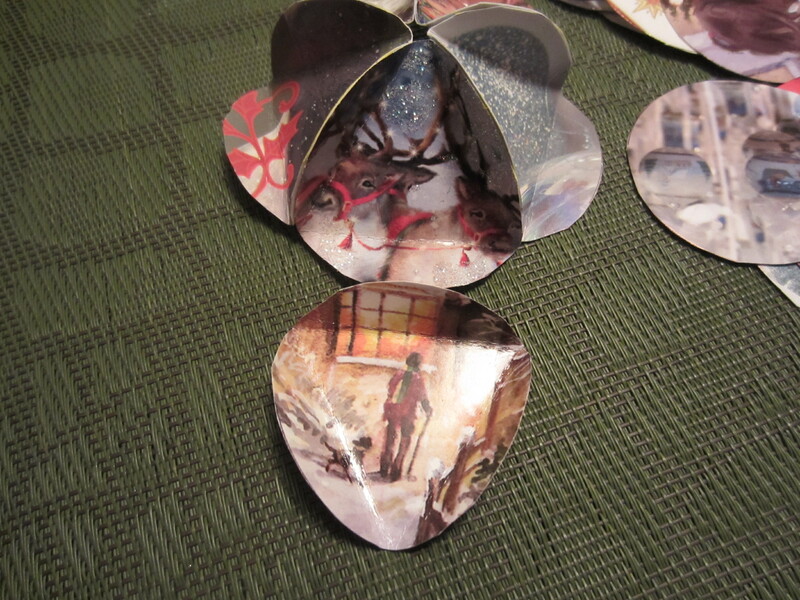 I found a couple of fancy floral picks that dangled metallic circles (again mimicking the pattern in the book). 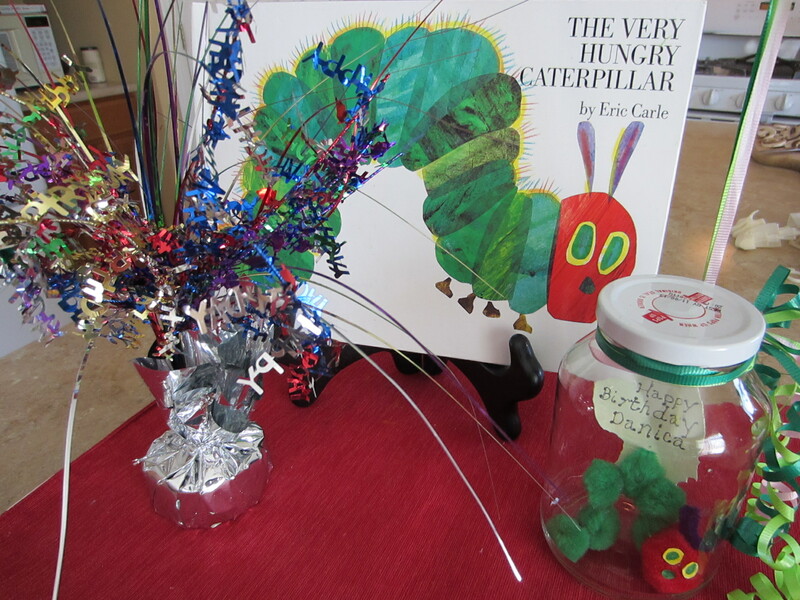 My kids and I created a caterpillar using one red balloon for the head and alternating green and lime green balloons for the body. The eyes were made out of card stock and we used scotch tape to adhere the balloons together. We hung this above the table and the kids really got a kick out of it! I used a few paper products, by alternating dark and lime green napkins and cake plates. The color coordination really brought this theme together! I made devils food box mix in a bundt cake pan to get the shape of the caterpillar body. Cut the cake in half for the top hump and then quarter the other half to get the right shape. I made an extra sheet cake in a 9″x13″ pan and cut two oval shapes for the head of the caterpillar. Then stacked the oval shape to make it the same height as the bundt. I frosted the cake with whip cream and tinted a bag of coconut green and reserved some to tint red. To color the coconut, place the coconut flakes in ziplock bag, mix 1/2 tsp of water with a few drops of food coloring (continue until you get the desired color). The birthday girl really enjoyed her cake – we have pictures to prove it.